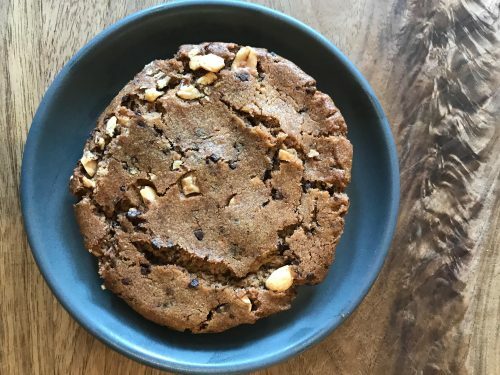 Since 2013, Omar has been running DOUGH & CO, a San Francisco-based purveyor of cookie dough meant to be eaten baked or unbaked (eggs are substituted for a slurry of white chia seeds). All proceeds from this collaborative cookie project will benefit La Cocina, a non-profit food business incubator for women and people of color where he’s been a long time volunteer. We are excited to have him write about the philanthropic side of his local business. I started DOUGH & CO five-and-a-half years ago. Though I never went to culinary school or business school, I had a strong innate passion for food. This passion was further fueled by the non-profit La Cocina. La Cocina helps primarily low-income immigrant women of color to start food businesses; I lived across the street, so I started volunteering. Seeing people go through the program was super inspiring. I quit my desk job and started renting commercial kitchen space from them on Sundays where I’d make small batches of cookie dough. From day one of starting DOUGH & CO, I knew that I wanted to give back to the community somehow. Part of the company mission statement is to “doughnate” 1% of our profits, 1% of our time, and 1% of our delicious cookie dough to nonprofits and causes that are important to us. Since starting my business, I’ve helped raise and donate over $25,000 to various non-profits around the Bay Area through cookie dough collaborations with like-minded folks. It’s not a lot in the grand scheme of it all, but it’s something – and that something can make a difference. I’m stoked and honored to collaborate with Dandelion, who generously provided their 70% Camino Verde Chef’s Chocolate (which I mixed in generously with a batch of my peanut butter cookie dough). It’s like eating a Reese’s Peanut Butter Cup, except in a sophisticated cookie form. All proceeds from the sales of this cookie will benefit La Cocina. The Dandelion/DOUGH & CO chocolate peanut butter cookie will only be available at the Dandelion Ferry Building cafe. And, it’s only around for a limited time – August 10-17, 2018. I really like it, and I hope you do, too.